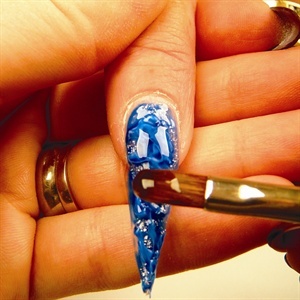 Surrey, Canada-based Olga Palylyk of Ornate Nailz by Olga specializes in gel nail art designs. 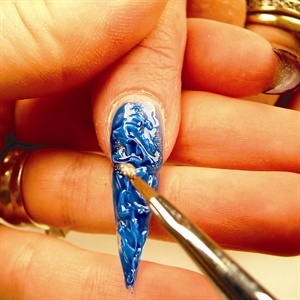 You can check out more of her designs at www.gelartnails.com, where there are both free and paid videos showcasing her step-by-steps. 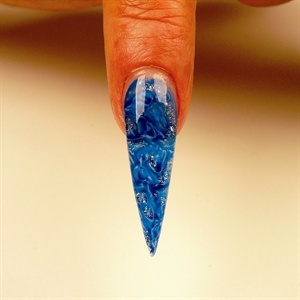 (The video of the 3-D gel marblelizing technique shown here costs $3 to view.) “Marblelizing using 3-D gel can be done in any color for any season — clients love it!” Palylyk says. This full set takes her an hour and a half, and she charges C$100 (U.S.$102). All named products are from Amore Ultima Gels. 1. Prep the nail and apply a form. Apply Bonder. Flash cure for 20 seconds. 2. 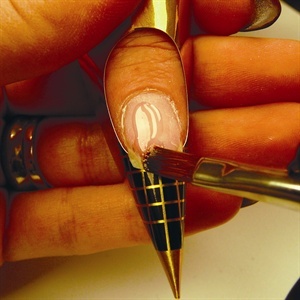 Apply Sculpt and Shine onto the form to extend the nail. Cure for two minutes. 3. 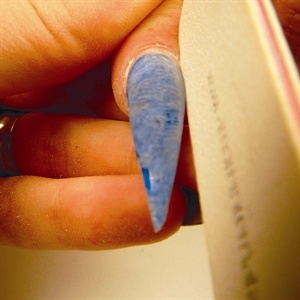 Use a flat detail art brush to pick up a small amount of White gel, then dab the gel onto the nail surface at random, lifting the brush to leave some gel “standing” in the air. Repeat the same motion in a different spot with the remaining gel on the brush, picking up more gel if needed. 4. 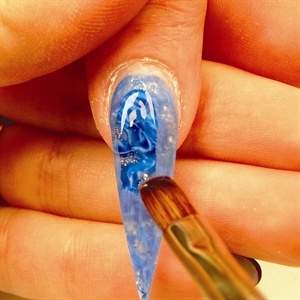 Continue placing the White gel onto the rest of the nail all the way to the free edge. Cure for two minutes. 5. 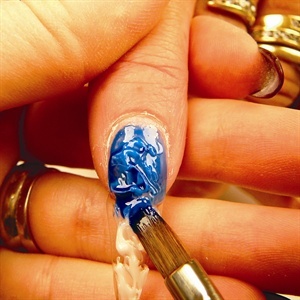 Apply Primary Blue gel over the white pattern. Let gravity go to work for a few seconds: The blue gel will settle into the grooves. Cure for two minutes. 6. Apply a little Pixie color gel in Silver Lining onto a few spots for a glitter accent. 7. Continue with the glitter application. Cure for two minutes. 8. 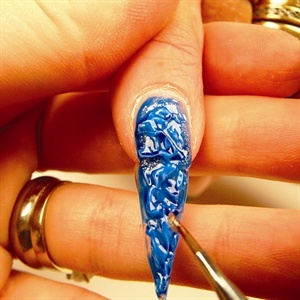 Apply Sculpt and Shine on the entire nail to even out the grooves and to balance the entire nail. Cure for two minutes. 9. Cleanse the nail. File, shape, then cleanse again. 10. 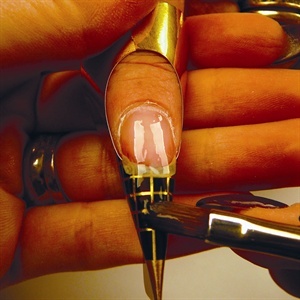 Apply Sculpt and Shine to seal the nail. Cure for two minutes. 11. Cleanse the nail one final time.